Researchers of the Land of Leopard National Park and the Beijing Pedagogical University have established the approximate number of wild Far Eastern leopards, at least 80 animals, the National Park press service reported on Aug. 18. "The information previously possessed by the researchers was collected exclusively on the territory of our country. The monitoring done in 2015 showed that about 70 felines were living in Russia. A growth in their population and the proximity of the Chinese border gave reason to think that some of the rare animals might have moved outside Russia. The leopard population in China was unknown until recently," it said. A delegation from the Beijing Pedagogical University, a leading researcher of the Far Eastern leopard and the Amur tiger in China, visited Vladivostok this summer. They said they had been conducting photo-monitoring of the rare felines in China on an area of 6,000 square kilometers since July 2012. A substantial databank was created over the three years and the results were shared with Russian colleagues. "The scientists shared some of the monitoring material at a meeting held in the Land of Leopard National Park's Vladivostok office. The count of unique animals showed that the world population of the Far Eastern leopard was at least 80 animals in 2014," it said. The administration of the Land of Leopard National Park and the Beijing Pedagogical University signed a long-term cooperation agreement to exchange information about the number of rare felines living near the joint border. The Far Eastern leopard is the rarest large cat on the planet. Its population in Russia was only about 30 animals in the early 2000s. There are 70 cats now. 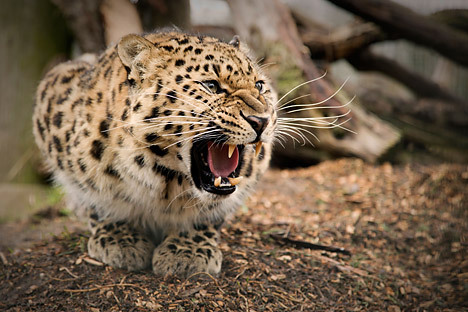 In Russia the animals live only in the Primorye territory, 90 percent of them in the Land of Leopard National Park. Trail cameras recorded the presence of 57 leopards in 2014.